Quill Engage is a data analytics and reporting automation tool designed to look at your Google Analytics account and provide you with reports that you can easily comprehend and digest. The system goes through your data, dissecting them via powerful algorithms and artificial intelligence to unearth essential and impactful insights that will help improve business performance and drive revenue and growth. With Quill Engage, you will be able to see and understand why your business is performing the way it is and identify areas that require attention and improvement. Insights are directly sent to your inbox and you can customize your reports so that they show only what you want to know. Google Analytics has become an essential component in business data analysis, sales and marketing, business strategizing, and more. But a lot of people, even those that are well versed and experienced in the business world, find it hard to make sense of their Google Analytics data. As a result, they make business decisions that are not anchored on reliable and highly actionable insights. 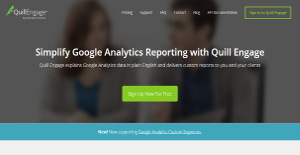 Quill Engage seeks to change all that by making Google Analytics data simple to understand. The software does all the grunt work of analyzing your data, including your KPIs, page views, bounce rates, and more. And after all the data is sliced and dissected, Quill Engage delivers all the insights on a silver platter, ready for you to consume and use to drive your business and achieve your goals. You will be able to see what powers your website’s performance and what hinders it. Your reports can be configured to reflect your branding and corporate image. Elements like colors, logos, images, and more can be embedded on your reports to give them that corporate look. Of course, you can also configure the KPIs and reporting sections to show information and insights that matter to you, your company, and your client. Setup is a breeze. Quill Engage doesn’t take much of your time as the set up process is easy right from the start. All you need to do is authenticate your Google Analytics account, pick your views and you are good to do. From there, you can configure the system to make it work for you, from sharing reports to scheduling updates and more. If you are interested in Quill Engage it could also be sensible to investigate other subcategories of Best Business Intelligence Software collected in our base of SaaS software reviews. Each enterprise has different needs and needs a system that can be personalized for their size, type of employees and customers, and the specific industry they are in. For these reasons, no software can offer perfect tools off-the-shelf. When you search a software system, first be sure what you require it for. Read some Quill Engage reviews and ask yourself do you need basic features or do you require complex functionality? Are there any industry-specific tools that you are seeking? Get the answers to these queries to aid your search. There are lots of aspects that you need to mull over and these include your finances, particular business requirements, your company size, integration requirements etc. Take your time, try out a few free trials, and finally choose the system that presents all that you want to boost your company competence and productivity. How Much Does Quill Engage Cost? We realize that when you make a decision to buy Business Intelligence Software it’s important not only to see how experts evaluate it in their reviews, but also to find out if the real people and companies that buy it are actually satisfied with the product. That’s why we’ve created our behavior-based Customer Satisfaction Algorithm™ that gathers customer reviews, comments and Quill Engage reviews across a wide range of social media sites. The data is then presented in an easy to digest form showing how many people had positive and negative experience with Quill Engage. With that information at hand you should be equipped to make an informed buying decision that you won’t regret. What are Quill Engage pricing details? What integrations are available for Quill Engage? If you need more information about Quill Engage or you simply have a question let us know what you need and we’ll forward your request directly to the vendor.